With a summer season lasting well into October - September is still considered high season - and almost tropical-warmth seas at the height of summer, Crete has one of Europe's longest beach-playing and beach-sunbathing seasons. 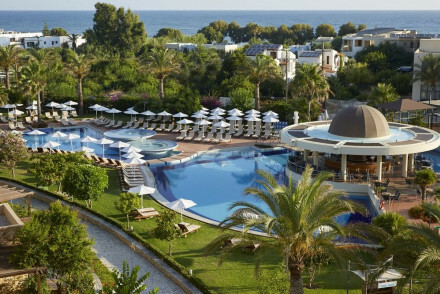 Our pick of the best beach hotels on Crete cover all options, whether you want a luxury resort or an off the beaten track seaside treat. North and north-east coast beaches are the most popular, with Réthymno boasting the island's longest sandy beach while places such as Elounda and Agios Nikolaos have grown into sophisticated resorts. But it's worth exploring beyond these coastal areas. Vái beach, for example, on the east coast is a classic palm-tree-dotted stretch of sand - more Caribbean than Mediterranean - made famous as the setting for the classic 1970s Bounty bar advert. Perhaps the most charming beaches are the secluded coves in the south and south-west. 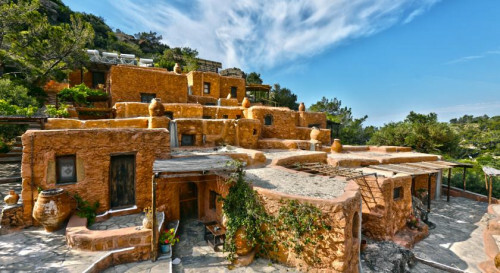 Some, such as Myrtos and Paleóhara still retain a hippy vibe from their 'alternative' mecca status of the '60s and '70s. Another beach worth making the effort to reach is on Elafonisi, a low-lying islet off the south-west tip and reached by a sand spit where sugary-soft sands encircle a beautiful lagoon. 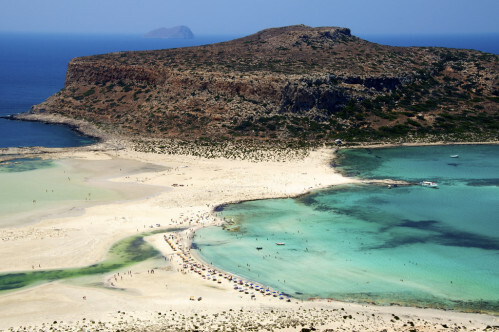 So you have a choice for the best beach hotels on Crete: the bigger resorts in the north, close to some of the main towns, or more secluded and potentially quieter coves in the south. Aspros Potamos offers exceptional value accommodation on the quieter southern coast, just minutes from the beach. Accommodation is in traditional stone cottages, which make the perfect base for a simple family friendly break. Also on the south coast you'll find White River Cottages, another property whose accommodation is in traditional stone cottages. There's the bonus of a pool on site and it's just a fifteen minute stroll to the beach. 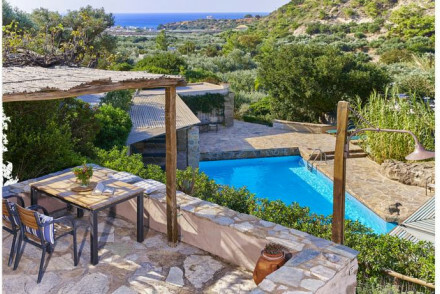 Quiet yet close to the beach, Villa Kynthia, in the low-key village of Panormos, offers both a family suite and a self-catering apartment. Rooms are cool and light with parquet floors and brass bedsteads. 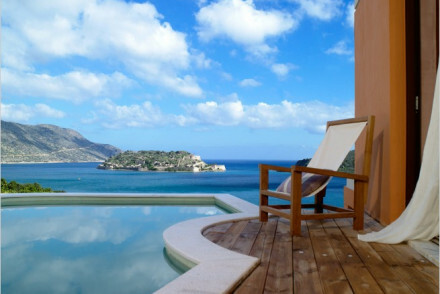 Hotel Porto Loutro is a hidden gem right on the beach with glorious views over the Med. It's off the beaten track, but once you get here, you won't be disappointed and doubles start from just €70 per night. 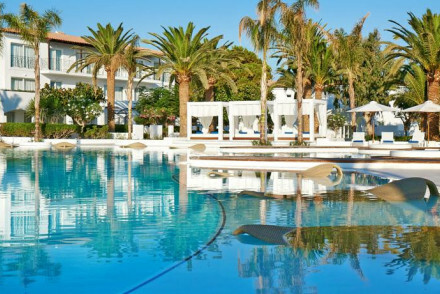 The modern beach resort of Aldemar Royal Mare Village and Thalasso will suit anyone who likes everything on-site and with a private beach. With over 380 rooms, four pools, a spa, watersports, tennis courts and restaurants, it’s like staying in a mini-Mediterranean village. Close to Agios Nikolaos, and right on the beach, Minos Beach Art Hotel offers white-washed Minoan-style cottages with contemporary-furnished interiors - some with private pools - plus waterside dining and peaceful gardens. A romantic, stylish choice for a beach holiday. The Minoa Palace Resort & Spa is a beachfront property for all the family. It's a five star option, but without the hefty price tag of some of its rivals. Out of the Blue Capsis Elite is a huge property, occupying its own private peninsula. So as well as superb facilities for all the family it has access to three private beaches, and an excellent array of watersports. Nana Princess is a stunning contemporary five star property in Hersonissos with its own private sandy beach. Almost all of the accommodation comes with a private pool, plus you'll find three fine dining restaurants, wonderful spa and tailor made services that are hard to beat. With only 69 rooms, the Caramel Boutique Hotel is like a luxury resort hotel but with an intimate feel. Right on Réthymno beach, if offers stylish white-and-blue rooms, a palm-fringed pool, shady gazebos and plenty of watersports. At the other end of the scale, Elounda Bay Palace is a full-blown, luxury resort with two semi-private beaches, several pools, endless activities for all the family - including kids' club, mini-golf, tennis, scuba diving, sailing - and five restaurants. As well as spacious rooms, there are bungalows and villas dotted around 20 acre of gardens. Equally swish - and perhaps just that little bit more smart - the Domes of Elounda offers a private beach, a huge spa, saltwater pools plus extensive children’s activities - and plenty for grown-ups, including snorkelling (if you’re feeling active) and wine-tasting, if not! There are also three restaurants, so no chance of growing bored. 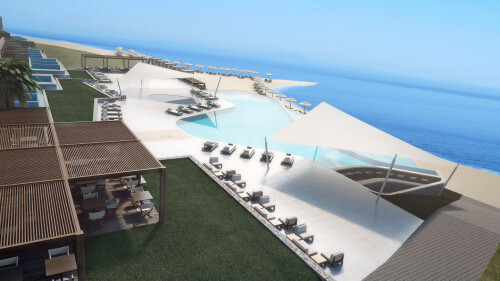 And if you'd like your own private pool, as well as access to a private beach, Daios Cove Luxury Resort might be just the thing. This sleek, luxury resort is close to Agios Nikolaos and offers chic villas and suites plus watersports, a luxury spa and three restaurants. 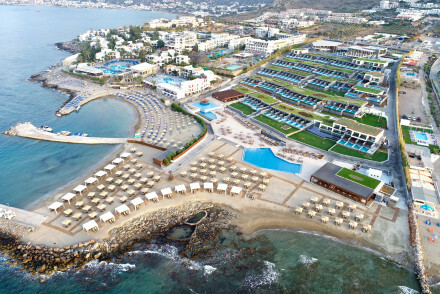 The island offers plenty of choice, whatever your budget, but be aware that the best beach hotels on Crete get snapped up quickly - especially if they have good children’s facilities. Nothing here that hits the spot, then widen your search to include all our Crete recommendations. A stunning contemporary five star resort that will leave you wanting for nothing! Luxurious rooms, suites and villas - most with private heated pools - boast stunning views and top notch amenities. Three fine dining restaurants, state of the art spa, private sandy beach. A spoiling beach treat! Spa - There is a modern spa & wellness centre offering indoor pool, holistic therapies and beauty treatments. 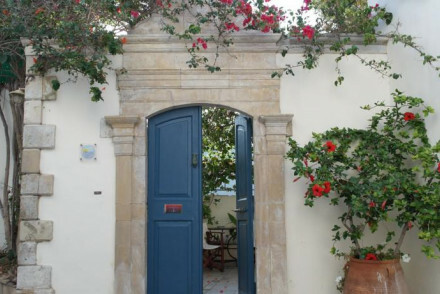 A home-away-from-home deep in rural tranquility with beaches, bars and tavernas a walk away. Small collection of traditional stone cottages make perfect base for families. Self-catering and BBQ available for all. 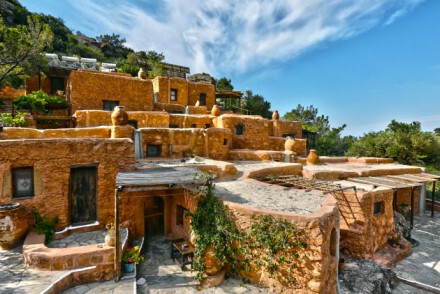 Return to simpler times at this beautiful hideaway on Crete. Eco break - They have restored the huts in a purely traditional fashion, using all natural materials and only renewable energy sources. Back to Nature - This stunning area of natural beauty combines beaches and mountains covered by lush greenery, pine, olive and citrus trees. Local markets - The local village with restaurants, bars and a market is only 1km away. A charming hamlet of 13 former shepherds cottages surrounded by olive groves and citrus trees. The self catering studios are rustic and quaint and with stunning views of the local area and sea. This authentic and secluded spot is a 15-minute walk from the beaches and local town. Romantic Break - The charmingly rustic self contained studios and apartments are ideal for couples looking for a bit of privacy and romance. Hideaway - Off the tourist track, this peaceful retreat is set in stunning natural landscape and only a 15 min walk to the beach. Great walks - Explore this amazing landscape on foot, full of olive groves, citrus trees and lovely landscapes. Sights nearby - Walk down through the olive groves to Makriyialos, the prettiest town on this stretch of coast. A great getaway to an idyllic blue bay in a car-free village, right on the beach. Off the beaten track, this tranquil hotel is ideal for a simple seaside holiday for families. Boasting unspoilt bay views, life plays out on a different tempo here. Utterly relaxing. Sights nearby - Fortress of Frangokastello - 8 miles. Families with children of all ages love this stylish, family-run hotel that hides itself on a quiet street just moments away from the beach in a low-key village resort. Cool rooms with canopied beds appeal to romantic couples too. Full of character - Quaint charm with a style all of it's own. Set in an out-of-this-world location right on the Cretan seafront. A collection of understated luxury rooms and bungalows elegantly decorated with simple white walls, furnishings and minimalist artworks. Excellent mediterranean dishes are served up in the restaurants. Ideal for totally relaxing. Honeymoons - A haven of tranquility with private villas with mountian and sea views, spoiling massages and haute cuisine overlooking the bay. Beach Life - Set directly on the crystal clear waters, indulge in diving, sailing, fishing or simply basking on the stunning beaches. Sailing - Venture out in the hotel's motorboat around the bay or day cruises to Spinalonga and Mochlos. Opulent resort of five hotels in one on a private peninsula. Highly discreet, with striking designs, each hotel different. Plenty of suites and private villas with pools. Seven restaurants. The resort is popular with wealthy Russians and others. Families - With Capsis Minoan Amusement Park, playground and supervised pool the kids stay happy and everybody gets a holiday! Beach Life - Set on its private peninsula in Agia Pelagia, with access to three beaches and a huge array of watersports. Elegant - in design, style and pace and service. Fishing - Fly fishing equipment and lessons are avialble. 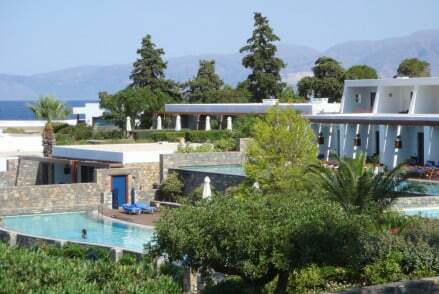 A modern North Western Crete resort and spa, surrounded by acres of lush landscaped gardens. The modern rooms boast private balconies overlooking the bay, gardens or pool. There are many dining options from Greek to Italian and the four bars serve up wonderful cocktails. Families - Parents chill by the pool while the youngsters make the most of the kids club, childrens playground and entertainment staff. Total relaxation - Relax to the max with hot tub, hammam, sauna, aromatherapy treatments and hot stone massages. A vast contemporary beach resort with all the trimmings, lush grounds, four pools and private beach area. Rooms mirror the outdoors, blue and breezy, some suites come with terraces and pools. Enjoy the many dining options, good spa and lots of activities - tennis, water sports and nearby nightlife. Romantic Break - Fine dining and sunset walks hand in hand meet luxorious suites with private plunge pools, plush beds and romantic sea views. Cooking classes - Resident chef George Hatzopoulos gives free weekly cooking classes on traditional Cretian food. Kids Club - Mini club for kids, swimming and all sorts of activites ages 4-12. Luxury resort with lots to offer families with children of all ages, but not overrun by kids. On a long stretch of sandy best close to Rethymnon – Crete's cutest town - Caramel is around an hour from Heraklion and Chania airports. Swimming Pool - Outdoor "confetti" pool - Large seawater pool with Jacuzzi, lily-pad designer sun loungers, day beds. Kids Club - The hotel has plenty to keep all ages occupied. Impressive luxury resort, totally insulated from the outside world in semi-tropical gardens. Large rooms offer mountain views or sea views from the large glass windows. Suites have private pools. An epic choice of restaurants and bars. Lovely beaches, ideal for a romantic break or family holiday. Families - The young ones are kept happy with loads of activities at the kids club and playground, while parents get time to relax. Active Holiday - Never a dull moment with mini golf, billiards, darts, tennis, scuba diving, sailing, waterskiing, fishing and more! Sailing - Either charter your own boat or take a skipper, and set sail directly from the hotel. 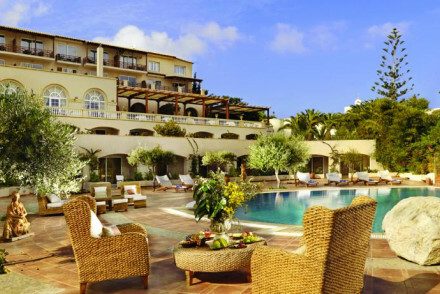 Stunning hotel and spa on Mirabello Bay with its own private beach and dreamy views. Incredibly family-friendly. Seamless rooms and suites with creamy furnishings, all the modern gadgetry, balconies, some with private pools. Three excellent restaurants, salt water pools and extensive spa. Luxurious. Child friendly - Numerous activities for children from tennis lessons and watersports to drawing classes. Families - Plenty of activities and kid's club to keep all ages amused. Luxury beach resort just minutes from Agios Nikolaos. Sumptuous suites and villas with cool contemporary interiors and fabulous sea views, and many with their own private pool. 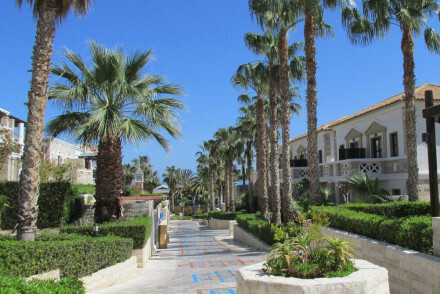 Private sandy beach, and fantastic facilties for all the family including luxury spa and kids club. Kids Club - Supervised kids' club for children up to 12 with a huge range of activities. Swimming Pool - Two outdoor seawater infinity pools, plus two indoor pools too! Sights nearby - Visit Agios Nikolaos Port.